First off, your babies are soooooo cute, Schrute!! And I love how colorful your cage is. One thing I wanted to ask, have you tried lifting up the ladder and latching it yet? I tried to do that the other day and it was nearly impossible to get the hook to catch on to the side of the ladder. Good job with the cage!! How do you like it so far? I tried lifting the ladder up and latching it but wasn't able to either. I thought it was just me not being able to do it with one arm and all. I think its because the hook they're using is intended for latching it at the end of the ramp on the FN. This hook needs to be a bit bigger so that it can catch on to the side of the ramp for the CN. Schrute - I have my opening in the front too, for the very same reason. I had a problem with this as well until my husband came over and did it for me. You just need to pull the hook forward as far as it will go and latch it towards the bottom of the ladder. It works easier this way. Yay husband! It's a bit different now. I threw the little wooden ball by the igloo and the cube away and the canoe is out. I got a pastel blue corner litter pan with carefresh in the back corner on the shelf. I'm not using the wood hides. There's some stuff from my Secret Santa in there. Most of the stuff is in the same place but I rearranged it. I like all of the bedding and accessories! 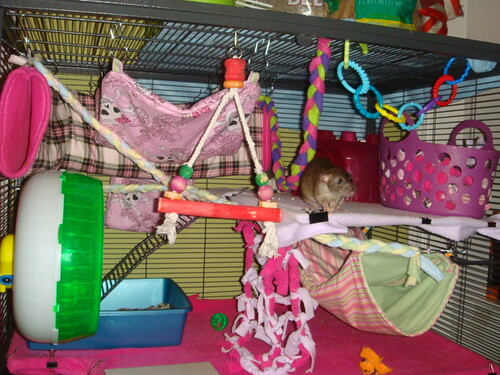 I love cages with a lot of hammocks, they look sooo comfortable! Im exhausted from living up to your expectations..
Ahhh I'm so jealous of you all and your two level CN's!!! Theres just no way I could get one any time soon I have no money, and no job (and no way to get to one anyway), and my parents are just as broke as I am. Fur, and Scales, and Scorpion Tails. I'm so excited my 161 should be delivered this week or the next. 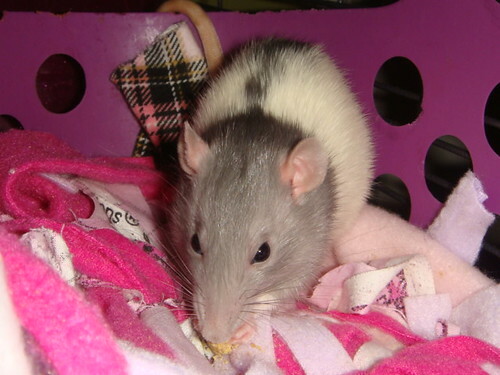 I'm going to head over to Goodwill to find some baby toys for my rats. I've seen some great little people's garages and other such things on this forum and others, and I'm just dying for something like that! Some people think the best way to protect animal life is to make scientists fear for theirs. Support the Foundation for Biomedical Research. Here's mine after cleaning tonight! Here is the CN from just the other day. Soon it will only house Spice and her 6 girls, as the 4 boys are getting separated tomorrow. I can't wait to decorate mine. It comes tomorrow. Quick CN question... Would 4 boys fit comfortably in this without fighting for space? I only have two now but I want to plan for the future. 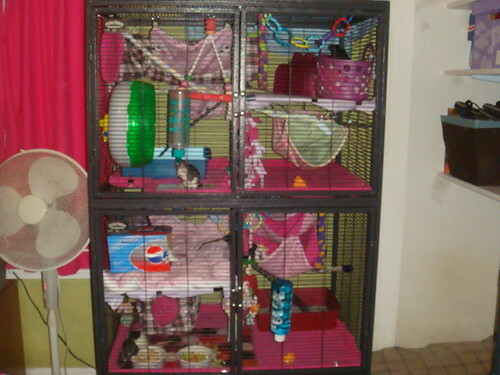 My cage right now is 30l x 18d x 33h and the cage calc says it can fit 5 but I will definitely want a new cage when I get money and move into my new apartment next year (this current one was bought used and is a bit flimsy with small doors and a slide-out pan). I think the pictures make me think it's smaller than it actually is.. Thanks for the info! If you're talking about getting the one-level CN, I believe that 5 male rats would be okay in it. I've heard some people say that you can even put six in there but I think that's making it kind of tight. Boys need room to get away from each other sometimes, y'know? Yes! I meant a 1 level. I'm debating between that and an R-695. This thread made me veer toward the CN!! I'd have 4 boys tops. I have 4 boys in my 1 level currently. They're all fairly big (haven't weighed them in awhile though, but my 27 month old is 1lb. last time I checked), and it's a great size for them. I wouldn't have an issue adding one more to the mix space wise, but my limit is 4. I cleaned and rearranged mine today. I kinda went all pink on this one. Jade enjoying the "basket o' scraps"
I have that same plastic basket with oval holes in it, but in purply blue She's widened all the holes. 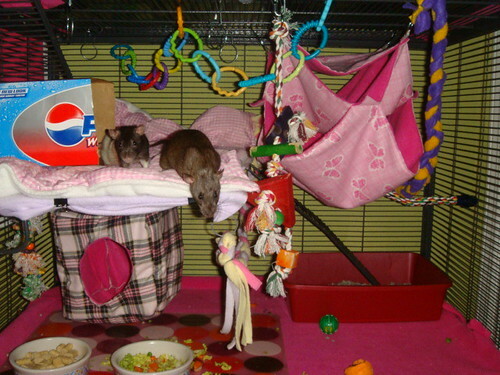 Hey, i have a standard wire cage and my rats like it, (well the dont seem to dislike it) but in all the cages i have seen, everyone has cloth as their bases, i have "breeders choice"cat litter, (recycled newspapper pellets). there is nothing wrong with this litter, i just surprised to see so many ppl with cloth as their bases, is this any easier to keep clean? and how do u keep ur ratties poop trained? i see u all have little litter boxes, i have tried a litter box, putting all my boys poop in the "litter box" but they dont seem to "get" it. My oldest boy Hoodinni (4mths old) actually jumped into the tray and started eating a pice of poo. . whats with that?? idk if he ate it all or was just seeing what it was, but should i just keep at it, and if im using pellets for the base of their cage what do i put in the litter tray?? There isn't really a trick to litter training, they just pick it up. My girls normally poop in their litter boxes at the end of the ramps, but they occasionally do it outside of it. 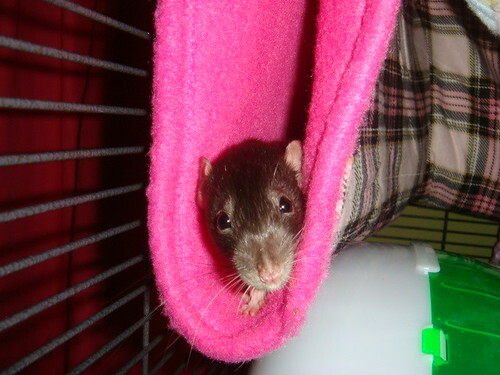 I find poops in their hammocks, tube and in the wheel. I am just consistent w/ keeping it up off the floor and putting it in the litter box. I also use a handheld vac 1-2 times a day to pick up any litter/poops that are laying around and that helps keep the cage clean. I find cloth bedding to be cheaper for me personally. When its dirty i wash it, and can reuse it. Using all bedding, you have to clean it out a few times a week and throw it away and use more. 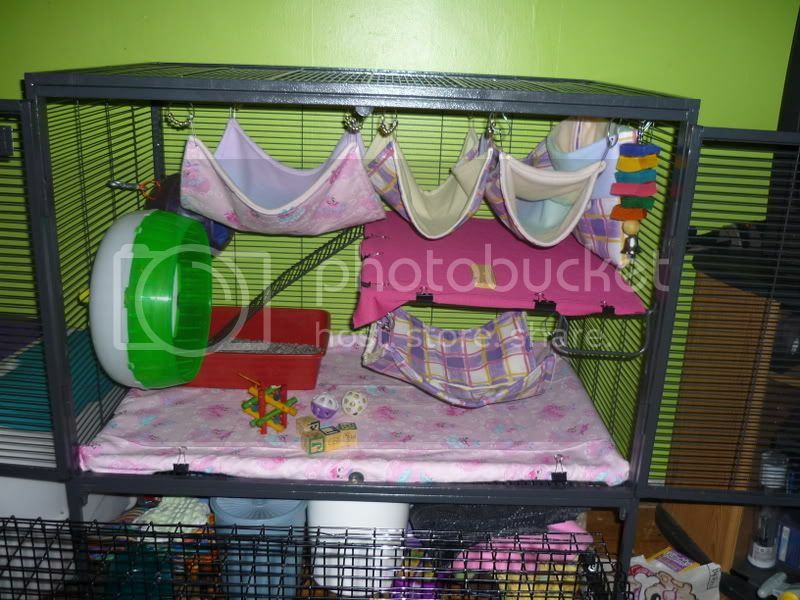 With the particular cage i have, bedding everywhere is not an option b/c the pans are way too shallow and it would just be thrown on the floor.